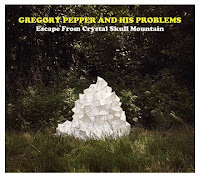 Guelph musician Gregory Pepper is a bit of an oddball. His music defies easy definition. On August 21st he returns with the new album Escape from Crystal Skull Mountain. The record, which may or may not have anything to do with a bad Indiana Jones sequel, should be another head-scratcher. Gregory Pepper & His Problems play the Silver Dollar in Toronto on August 24th. We do our best to ensure that all MP3s posted are approved by either the band, its management, publicity agent, or record label. If you feel your song has been used inappropriately please email us here and we will remove it. If you like an MP3, buy the album.